As a U.S.-bound caravan continues its slow arduous journey up from southern Mexico, it’s become propaganda for politicians in Washington. But most have no idea of their part in the political storm over immigration — they just feel its repercussions. An inexpensive stroller with frayed, misshapen wheels sits abandoned by the side of the highway, just outside Juchitan, Mexico. It's not designed for weeks of highway walking under a scorching sun. Migrant parents left it there as they scrambled desperately onto a passing truck clutching their toddlers, and a few bags of belongings; grateful for a short ride to ease their journey. Patience wears thin among 4,000 Central American migrants journeying to U.S.
After two weeks mostly walking in southern Mexico, the caravan of about 4,000 migrants is pushing north at a faster pace, using wheeled transport, where they can get it. A faster group is aiming for Mexico City this weekend, with another group of mostly families setting out Sunday morning from Isla, Veracruz. 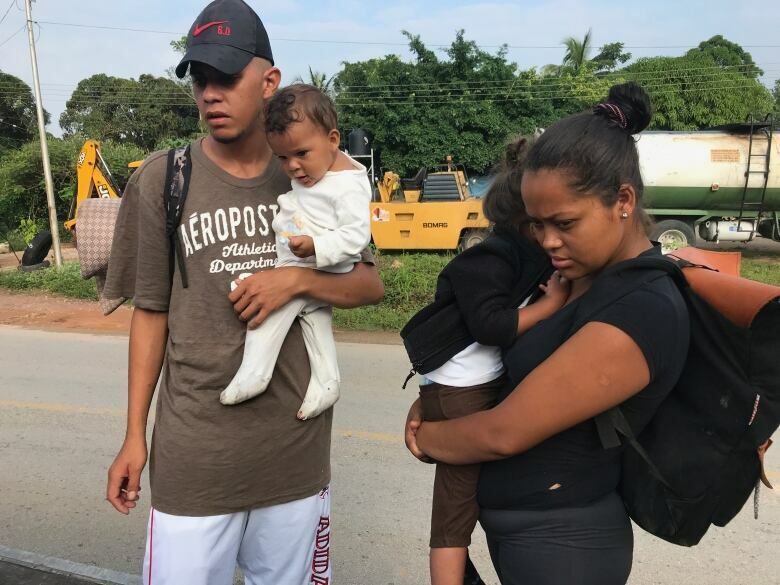 Sinthia Mercedes Guitterez, travelling with four children, was setting up a red tarp in Donaji — after walking since about 4 a.m.
She admitted she's considering her options now after three weeks on foot. Back home in Honduras, her brother-in-law was murdered by gang members, her husband was threatened, and the family can't go back. Would she consider quitting the caravan? "It's not me," she said. "It's the kids. They're getting too tired." She'd heard that U.S President Donald Trump was fortifying the border with an extra 5,000 troops, at least. "If he won't let us all in, maybe just the mothers with children," she said grabbing at diminishing hope. "If not I'll try to go to stay with my sister in Monterrey, Mexico." As this caravan continues its arduous journey up from southern Mexico, it has become propaganda for politicians thousands of kilometres away. With the stress of just getting by every day, most of the caravan's members have no idea of their part in the political storm over immigration, days before the U.S. midterm elections. They just feel its repercussions. On Friday, after a disastrous night in the migrant camp at Matias Romero, when a sudden storm flooded the playing field where they had bedded down, about half of them packed up after midnight and started walking rather than sleep in the wretched wet grass with the risk of snakes. A second baby in the caravan was born that day. The other half stuck it out til before 5:00 a.m but to catch up with the fast group they had to keep moving a total of 112 kilometres, the farthest they'd travelled in one day since reaching Mexico. It meant hitching rides on transport trucks, long flatbeds jammed tightly with migrants. We saw one steel container truck open at the back with travellers clambering inside in 30 C heat. 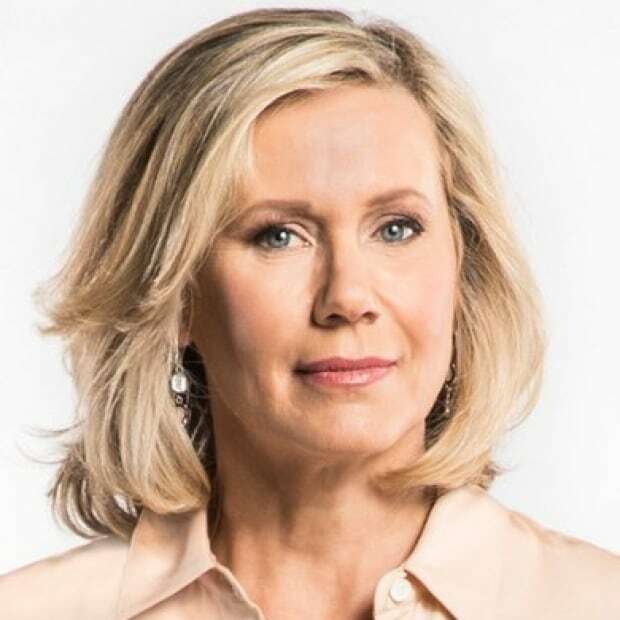 At one stop, being told she had to go on, a teenage girl sobbed at the side of the highway, hiding her face with a pink fleece to avoid showing her misery. 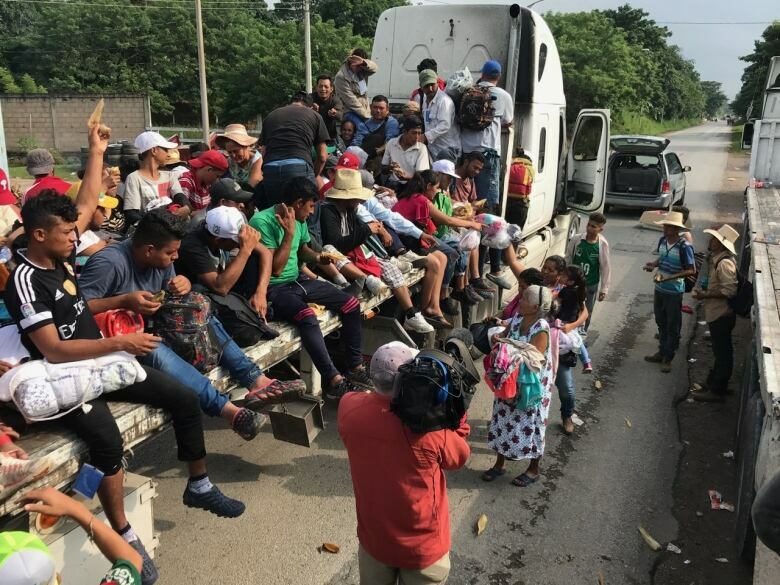 "They're mad, desperate, there's a lot of sick people," said Juan Jose Garcia with the Mexican Human Rights Commission, who is following the caravan, trying to ease their way. "Stay here and live what they lived last night at the flooded campground. They are not in the mood for stopping, they are looking for a way to keep going" to find better shelter. Late that day at least half of the group had reached Sayula de Aleman in the state of Veracruz, and their push forward was rewarded. Veracruz state Governor Miguel Angel Yunes promised 100 buses to take them to Mexico City, as soon as Saturday. Walking would have taken them about six days. But within a few hours he reversed his plan, citing a water crisis in Mexico City, which has demanded residents restrict water use until Monday. 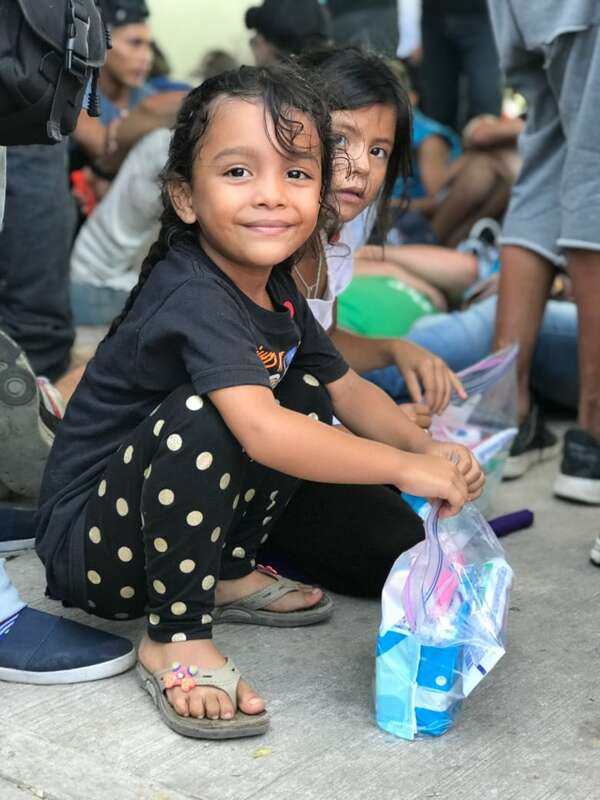 The UN has estimated about 2,300 children started out in this caravan. In a letter, de facto leaders of the caravan urged Yunes to "fulfil his offer," saying, "We consider that the argument of a shortage of water is not a valid one." Some humanitarian organizations in Mexico City had reportedly arranged for enough water. Underneath this latest disappointment is a suspicion that the Mexican government is actively trying to restrict their movements, corralling them in the most southerly parts of Mexico, under pressure from the U.S.
White House spokesperson Sarah Huckabee Sanders said last week that "Mexico had stepped up in an unprecedented way." "They have helped stop a lot of the transportation means of these individuals in these caravans, forcing them walking," she said. "They have helped us in new ways to slow this down, to break this up and keep it from moving as aggressively toward the United States." This is not the first such migrant caravan, but its timing just prior to the U.S. midterm elections has turned it into a highly politicized target. It has meant the migrants, fleeing violence and poverty in their homes in Honduras and Guatemala, have become pawns in a political drama, over which they have no control. Many migrants said they were unsure of their status even if they managed to get to the U.S. border. "The truth is we don't know," said Jose Armando Colindre, wearily waiting atop a flatbed trailer with his wife and two young daughters, clutching their Barbies. He is from San Pedro Sula, Honduras, where the caravan formed Oct. 12, started by Bartolo Fuentes a former Honduras congressman. But Colindre insists it was not politics which drew in the refugees; it was their desperation. "No jobs, no security or future for the kids." Fuentes was arrested en route, in the first week in Guatemala; by then the caravan had assumed its own momentum and was growing. As of this weekend there are now three active "caravans" from Central America inside Mexico, with about 5,300 people, down from the 7,000 who initially broke into Mexico on Oct. 19. In spite of the U.S. president's warnings of an impending "invasion," the International Organization of Migration (IOM) said this weekend the caravan poses no threat, that it is a normal annual event that has been going on for more than a decade. There are, however, those using the caravan as a cover — travellers who have no chance of getting into the U.S. legally. A handful of men revealed in interviews they'd already been deported at least once from the U.S. He called that "blonde guy a racist," fuming against immigrants when the United States was a country built from immigration. "I was born on the American continent," he said. "I'm quite sure Trump's [ancestors] are from Europe." Questioned about the thousands of additional troops deployed to the border, he said, "We are like an anthill, if they kill a few of us, more will spread." And he revealed he might "hire a coyote to get in faster," meaning a smuggler. But his opinion was exceptional amongst the people CBC interviewed. Outwardly, most were not bitter toward the U.S. or its government. Instead they appealed for understanding, and for humanity. At one stop, Manolo Rojas Benitez, a grandmother, stood at the side of a flatbed truck flinging donated clothes and food up to the travellers. She'd brought her son and her grandson to help the strangers passing through. "They are suffering," she said. "We feel it, too." Still, as the days stretch out, doubts creep in for some, that they will ever reach the place on which they hitched their hopes. Many place their faith in God, who will guide their way and determine whether or not they reach the northern border. As they departed one town for the next, 60 kilometres away, a priest and two nuns touched the tops of their heads, whispering prayers for their journey.